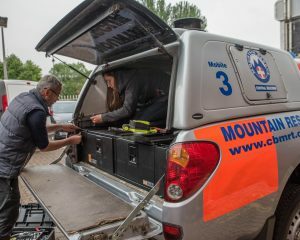 The addition of the Gearmate system adds organised storage to the Mitsubishi L200 donated by South Wales Police, making it even more useful to the team. Photo: Ann Seymour Photography. The generosity of South Wales Constabulary and a company based in Warwickshire is helping to keep Central Beacons Mountain Rescue Team on the road and available to its community and visitors in need. Since a fire at the team’s base in Merthyr Tydfil in November 2017, team members and their supporters have been fundraising and seeking support to reach a target of £250,000 to renovate their damaged base and to replace the team’s specialist vehicles and equipment. (From L to R) Jon Goddard, Central Beacons MRT; Jennifer Bonson, Project Manager, Gearmate; Angela Oliveira, Marketing Executive, Gearmate; and Paul Richards, Central Beacons MRT. Photo: Ann Seymour Photography. One significant donation came from South Wales Police, which has given the team a Mitsubishi L200 vehicle. This has been given the familiar livery and blue lights of a mountain rescue vehicle and also has an added extra to make it even more useful. Gearmate of Alcester in Warwickshire heard about the fire and destruction and offered to fit a team vehicle with a donated full drawer storage system and this has now been fitted into the L200. The team from Gearmate met with Paul and others from the team at the temporary base at Merthyr Tydfil Fire and Rescue Station on 24 May and the vehicle is now in full use on call outs across the Central Beacons area.